After reviewing Warbot Assaulter's bot and plane modes, I was supposed to touch on Assaulter's carrier mode but completely forgot! D'OH! G1 Broadside is a triple-changer. Besides the bot and plane modes, his other mode is an aircraft carrier. Likewise, FP Assaulter also has a carrier mode. 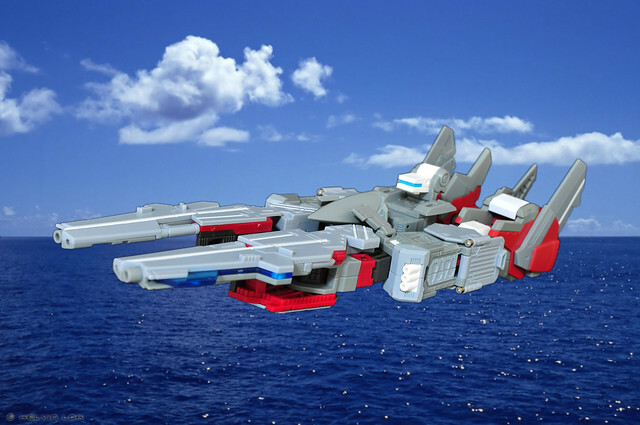 While G1 Broadside is a modern day aircraft carrier, FP Assaulter is like a futuristic space carrier. I like to think the bigger size Assaulter carrier makes it to-scale with the Broadside carrier. In Transformers, there are a number of bots that can shrink or enlarge when they transform into their alt modes. This is known as 'mass shifting' among TF fans. When Assaulter transform into his carrier mode, it is quite long compared to his bot mode and gives the impression he has 'grown'. Whether or not this is an intentional design by FansProject, it is still quite cool! 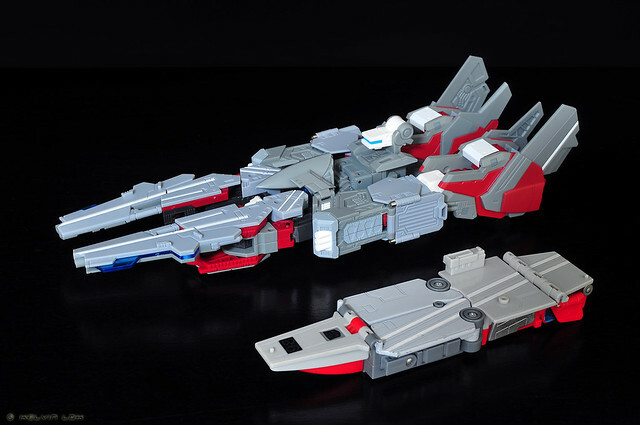 Assaulter's carrier mode looks like a cross between the SDF-1 and Macross Quarter. Another inspiration from Macross! Unfortunately this carrier mode is his most flimsy mode. The front and back halves are pegged together by 2 small pegs that require a lot of force to push in, and yet still pop out easily. To me, the carrier mode looks impressive in photos but is a pain to handle. Overall, Warbot Assaulter is one of the better Transformers third-party... heck, overall Transformers toy to be released in 2012! In 2013 I see myself buying even more third-party products than the official Hasbros or Takaras. Haaa!